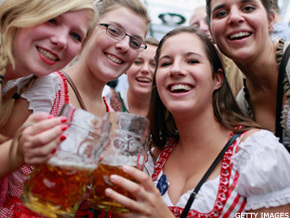 NEW YORK ( TheStreet) - There may be approximately 2,000 "Oktoberfests" organized annually throughout the world, according to the official site of Munich, but the German city's Oktoberfest, which is currently underway, trumps all of them. The three-week long festival, hosted on 26 acres near Munich City Center, will welcome about 6 million beer lovers, employ 12,000 workers and generate an estimated 1 billion Euros for the city. Dating back to 1810, when Bavarian Prince Ludwig married Princess Therese of Sachsen-Hildburghausen in an epic five-day wedding celebration, the Munich Oktoberfest is said to be the largest folk festival in the world. Munich Discovered is a comprehensive travel guide to the city of Munich. Users can find catalogs of gardens, castles and palaces, cathedrals, food and drink, museums, markets, shopping and more through a drop-down filter. Each listing includes a set of images, the cost of entry, the neighborhood, the distance (if users input their current location) and a map. For returning visitors, the app includes the option to highlight a site or location as a "favorite" and include notes. Users can also submit comments, suggestions and questions to the author, Amy Eckert, who has written about Germany for Michelin guidebooks, Frommer's Europe by Rail guidebook, and articles for German Life, AAA Living, British Airways, Air France and KLM. This easy-to-navigate app is a must for those exploring what Bavaria has to offer beyond Oktoberfest. However, important information about Oktoberfest, such as location and an official Web site link, is listed under "Festivals" and "Food & Drink." This $2.99 app is compatible with Apple ( AAPL - Get Report) iPhone, iPod touch, and iPad, but requires iOS 4.0 or later. Wiesen 2012 is an amusing way to navigate through the 14 festival halls (popularly known as "beer tents"), 15 small tents, and 114 kiosks selling sweets, fruit, souvenirs and coffee at Oktoberfest. The list of tents include details about the managing brewery and beer price. Other than the €14.60 wheat beer sold in the Weinzelt Tent, the average price for one liter of beer is €9.35 this year - 43% more than one liter of Oktoberfest beer in 2002, according to the City of Munich's official site. The app's cartoon icons can be deceiving, but Wiesen 2012 includes extensive information on the festival to enrich visitors' experiences at the Oktoberfest. It includes a map with directions to amusement rides, attractions and activities around the fairgrounds, another map directing users to local nightclubs, a weekly weather forecast, transport information, beers, and beer prices from each year and a festival program, beginning with the opening ceremonies on Sept. 22 to the closing on Sunday Oct. 7. The app also includes a dictionary of Bavarian terms and a live video of the festival grounds. The most entertaining, but arguably most useful, feature calculates users' blood alcohol level based on the time of day the first beer was consumed, the number of beers consumed, and the user's gender and weight. Oktoberfest - Video Bubbles Viewer gives a glimpse of what to expect for those preparing to travel to Munich for the world's largest beer festival. Powered by Google's ( GOOG - Get Report) YouTube, the 180-degree panoramic videos display un-edited activity in and around the extensive beer tents, such as a performing brass band, a woman selling roses in traditional Bavarian garb, a singer, and a tour of the festival grounds. Beware; the videos of the "Kettenflieger" merry-go-round, Ferris wheel, monster carousel, gravity carousel are slightly nauseating. This 99 cent app is compatible with iPhone, iPod touch, and iPad, but requires iOS 3.2 or later. Talk Oktoberfest Bavarian - Phrasebook for English helps visitors immerse themselves in the local culture by providing 52 Bavarian phrases for placing orders, flirting, swearing, toasting and greeting. Each listing is accompanied with an audio clip to help users with their pronunciation, but if Mogst tanzen, madl? ("Would you like to dance, gal?") doesn't role off the tongue easily, try playing the audio clip for the locals. This $1.99 app is compatible with iPhone 3GS, iPhone 4, iPhone 4S, iPhone 5, the third, fourth and fifth generation iPod touch, and iPad, but requires iOS 4.2 or later. Beer Wizard will help those returning to post-Oktoberfest-life quench their thirst. The app opens with a mouth-watering close-up of honey-colored beer gently sloshing in a glass before displaying a screen with "BEER you know, by FOOD pairing, or by beer STYLE." By selecting one of these three options, users can explore a comprehensive database of American "craft beers," meaning beer not brewed by a "mega-brewery" such as Anheuser-Busch ( BUD or Miller Coors Brewing Company. Users can navigate the Beer Wizard application by selecting a brewery name, beer name, style and country of origin. Then, users can sort results by selecting a food pairing, such as barbecue, Chinese, or buttery or sharp cheeses. More sophisticated beer connoisseurs can specify color and bitterness by selecting International Bittering Units (or "IBU") to measure the bittering substances in the beer. Light lagers typically have an IBU rating between 5-10, while big, bitter beers can have an IBU of 50-70, according to Beer Wizard. Finally, users can input their location and select an option for beers on tap. The app is focused on educating users about quality beer, so although it allows recommendations of beers missing from the database, it warns that all beers go through an extensive vetting process. This 99 cent app is compatible with iPhone, iPod touch, and iPad, but requires iOS 5.0 or later.